MMO MMORPG News·Articles·Total War: Warhammer 2 Review – Second Verse Same as the First? Total War: Warhammer 2 Review – Second Verse Same as the First? I enjoyed the first Total War: Warhammer. It was fun, and it was mostly the same offerings of the Total War franchise with a bit less of the political machination that I’m used to. Sure, there was political stuff going on, betrayals and the like, but Warhammer is less “Can I trust my second cousin to run this task for me, or will he run it into the ground?” and more “The moment I feel like I can’t trust them, I’m going to destroy their city, salt the ashes, and move on”. That is way more fun, anyway. 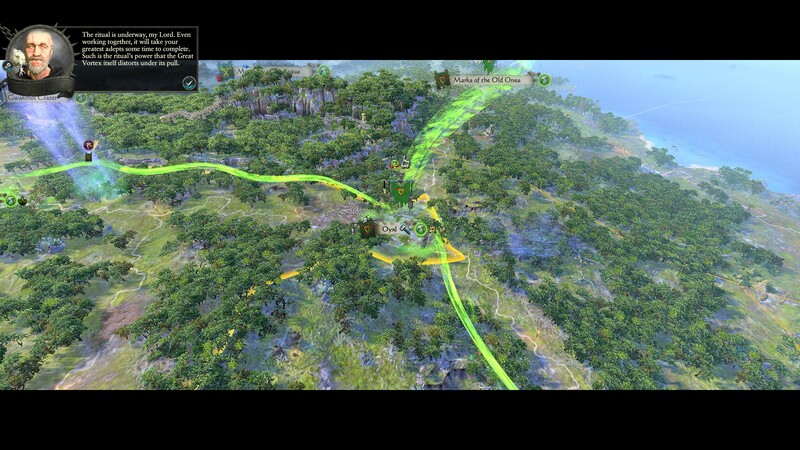 Is this the best Total War game ever? Mm. Hard to say. In some ways, absolutely. But I’m not here to compare it to Total War: Shogun (which is, if I’m being honest, probably my favorite of all), but to look at this one as a whole. Personally, I think this is a huge step up from the first title. It feels more like a Warhammer title. And sure, there are people complaining that all eight factions aren’t playable yet, but the “Mortal Empires” update is on the way, so don’t fret. There’s still plenty to do here. Is it perfect? No, I’d say not. But behold, Total War: Warhammer 2: The Quest for the Great Vortex! Mazdamundi is ready for that tasty Vortex action. I think one of the biggest new features is the Vortex. The Great Vortex swirls and whirls, and it is a source of contention for all of these factions. They all want to control it for one reason or another. The campaign is a big race to control it, completing Ritual after Ritual, and then having to deal with frustrating, powerful groups of Demons as they march onto the island. Or … follow me, here … you can just ignore it! Let someone else do all the hard work and heavy lifting. Prepare a massive army and when it’s time for the final battle, they’re war-weary from having to defend from every Vortex ritual, you sweep in and take all the glory for yourself! I think it’s a neat idea, but I worry that the Vortex being the only main goal of the game will reduce replayability, at least a little. Of course, there is the other victory condition: destroy all of your foes! This was the most satisfying for me. 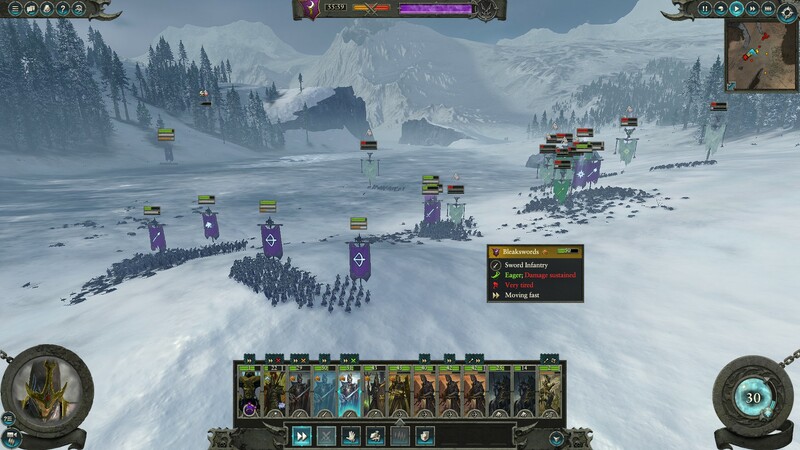 While the High Elves and Lizardmen were scurrying for the Vortex, my Dark Elves were stomping the Skaven and the other Dark Elves out of existence. Here we have the Dark Elves in their natural habitat: Surrounded by dead foes. High Elves: Lothern (Easy), and the Order of Loremasters (Hard). Intrigue: Influence can be used to recruit superior Lords, or it can be used to influence diplomatic relations with other factions. Very useful, that. Espionage: The shady, shifty High Elves can see direct lines to assets of their allies whom they have Trade Agreements with. Always be wary of trade with them. Martial Prowess: Greater coordination when High Elves enter battle at full strength. A rested army makes a superior army. Honestly, I found the High Elves kind of bland, other than the tactical/diplomatic stuff. Being able to influence others appeals to me. The rest was kind of … Meh. Not quite as fun as the other factions. Skaven: Okay, this is probably my favorite faction, even with Dark Elves on the table. Queek Headtaker (Hard), Lord Skolk (Normal). Food: This is the major component of the Skaven gameplay. Food. The more food you have, the better. You need to maintain high food supplies to gain growth bonuses and to avoid starvation penalties. You can use food when you claim a city to increase its rank/power a bit if you have the spare food to do so. 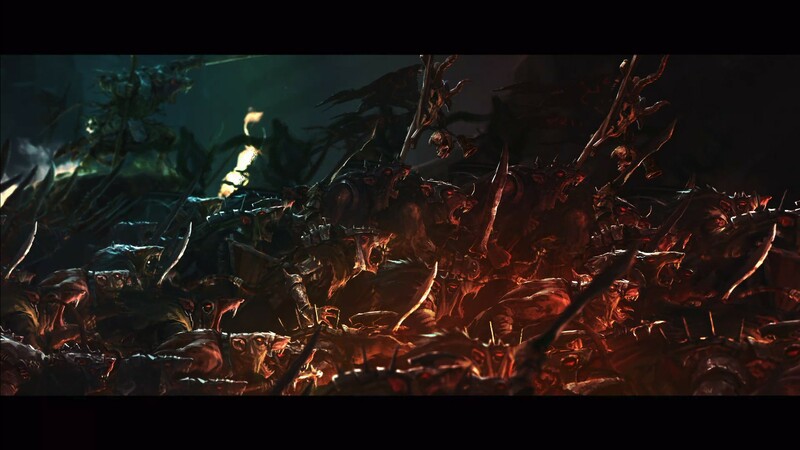 Skaven Corruption: It’s a detriment to the populous but lets you spawn additional Clanrats in local battles. However it can get too much even for Skaven, so be aware of the corruption levels. 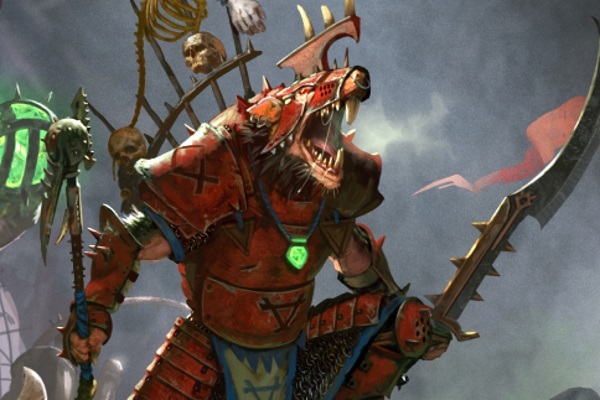 The Skaven are my favorites in this game because they retain that unique flavor that only the Skaven have in the Warhammer universe. The cities of the Underempire appear on the map as ruined areas, and unless you see a Skaven enter it, you’ll never know if you’re walking into an army, or simply some ruins to explore for treasure. Dark Elves: Malekith (strong) and Morathi of the Cult of Pleasure (Hard). Though Malekith gains +30 with Cult of Pleasure, they just wound up being in my way, so most games I just crush them as soon as I possibly can. And Malekith’s ability to give a percentage of his XP to his lords is great for when you have Lords defending cities and not out killing stuff. Black Arks: These powerful Naval Units can be used to recruit new units, replenish weakened units, and bombard battles they’re within range of. Slaves: This was one of the hardest things to juggle for me. Slaves provide a bonus to provincial economies at the cost of public order. So you really have to balance this carefully. Murderous Prowess: Being granted a boon from Khaine, they gain increased combat prowess, should they kill enough enemies. So it definitely behooves you to be in the field with Malekith or Morathi, murdering armies. I enjoy the units and gameplay of the Dark Elves, but it might have been a bit above my tactical depth. Lizardmen: Perhaps the most ferocious fighters, and the birthplace of Magic. Lord Mazdamundi (Easy) and Kroq-Gar (Normal). Only having Easy/Normal is sort of nice, and they’re a solid place to start for newcomers. Geomantic Web: Lizardman settlements are linked by a magical network that increases the power of their Commandments. Special Spawnings: Periodically, you’re given a mission which will reward you with special Blessed variants of certain units. These become top priority to increase the strength of your army. Bestial Vigor: There are Beasts for every task in the Lizardman army, but some might lose control and charge forward in battle, lost in their bloodlust. I had the easiest time conquering and marauding as the Lizardmen but were not quite as fun as the Skaven. But I feel like they might be easier to play for most players, given the base difficulty of both Legendary Lords. Diplomacy, like I said, is pretty weak in this game. If you enjoyed combat in the last game though, you’ll continue to love it in this one. I also truly enjoy gaining powers/buffs for defeating other Legendary Lords. It makes conquering have a greater appeal and is just another reason for me to forgo the main story and just work on destroying all of my enemies. I will say that every unit in the game looks gorgeous on the battlefield, but moderate PCs may begin to slow down the more units there are at once. 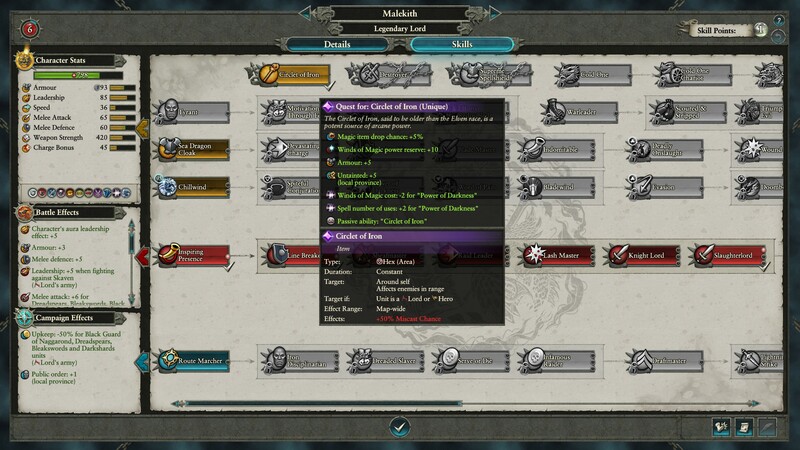 The majority of the game feels the same as the last one, including the skill tree for Lords/Legendary Lords. But unlocking powerful equipment and spells from completing objectives/killing Legendary Lords/searching ruins? That’s awesome. You really have to take care when building stuff in your cities though. It’s like a tech tree, and you don’t want to have too much overlap. 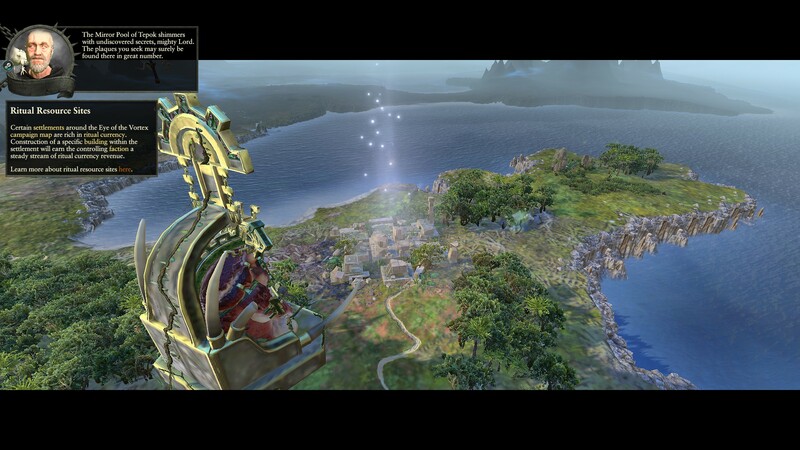 The game will warn you when you have a building in already, and this was an issue for me because I was treating it like Civilization at first, spending time making sure all of my early cities were built in a similar manner. Don’t do this! I enjoy the vast distinctions in the various factions. Each army plays differently on the field, and though I do think the AI isn’t a whole lot smarter, it was enough for me. Maybe it’s because I’m not an RTS God or even all that great at the Total War games. 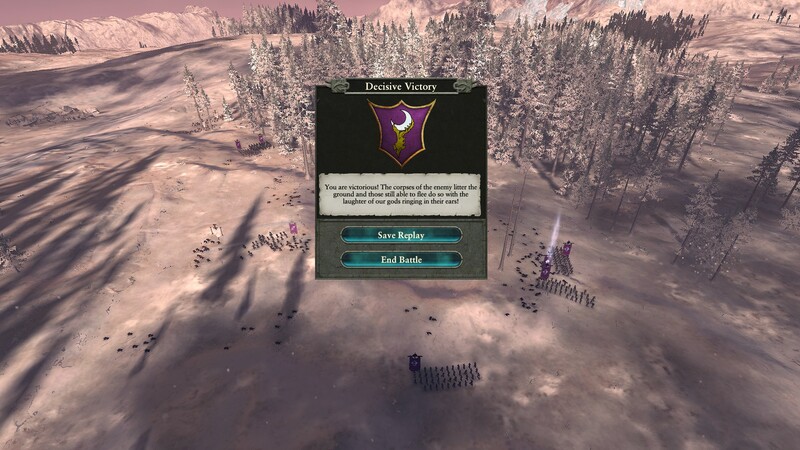 Some of the more tedious battles I’d rely on simply having a bigger, stronger army and auto-resolve because I knew I had virtually no chance of losing, but if there’s even a chance I could lose I handled it myself. I’m glad that each faction is different and special. From the high-cost but martially superior High Elves, to knuckle-dragging Rat Ogres, Black Arks unleashing hell upon coastal battlefields and aggressive, fury-filled Lizardmen, there’s a lot going on, and no matter which you want to play as, I think you will find enjoyment. Of course, there’s always going to be that person that yells “WHERE ARE NORSCA’S NEW UNITS? !” and that is admittedly a fair question. They will be playable in the next DLC, but I hope they’ll have updated units. Mods aren’t quite there yet, nor are the quality-of-life changes that came with the last updates of Warhammer 1. But when Mortal Empires appears, so will these things. It’s not like they’re making you buy a Season Pass to get that content. I found the menus to be kind of tedious and annoying, and a trifle unfriendly. As far as the advisor goes, it was disappointing to have an occasional faction character advise you, then the other guy. I’d love to stay immersed by having a faction-character give me all of my advice/tutorials in that same style. I enjoy this game quite a lot, it’s a step up from the first game, but I still feel like it’s lacking a little something. I was a little disappointed in one thing: while I love how different the factions play, in gameplay and in combat; I’d like them to all be searching for a different goal. Everyone seeking their own benefit from the Vortex kind of felt bland to me.